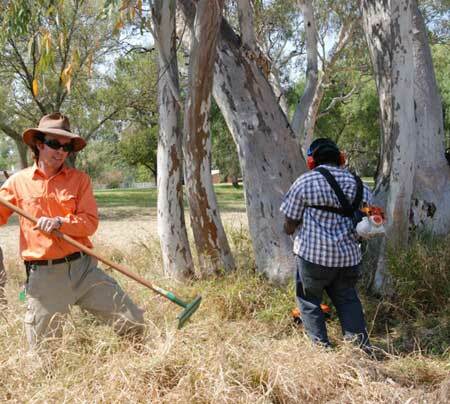 Many Landcare groups around Australia focus on tree planting but in Alice Springs the chief concern of this small band of volunteers is tree protecting, by controlling weeds and preventing wildfires. Leading their David versus Goliath efforts has won a nomination for the National Landcare Awards for Tim Collins, chair of Alice Springs Landcare. He is one of 88 finalists. Alice Springs Landcare came together because they could see the local landscape changing ‘before our very eyes”, says Mr Collins. You drive or walk around town and “you see the gaps”, he says: where once there was a magnificent river red gum, now there’s a blackened stump or an old giant lying there, shattered on the ground. And few young trees are growing to take their place. The problem can be sheeted home to lack of adequate fire management and the rise of buffel grass which fuels wildfires, says Mr Collins. To date, neither the NT Government nor the Town Council have committed resources adequate to the cause. Mr Collins sees a “decent, comprehensive fire management plan” supported by a “whole of community” effort as the solution. Council, as trustee of the river, could help by having an Urban Bushcare Officer to encourage members of the community to get involved and adopt sections of the river to look after, and then coordinating their efforts and liaising with council and government staff. “Lots of councils around Australia have them,” says Mr Collins. The return to the town would be priceless, as a key drawcard for both residents and tourists is the beauty of the landscape. The model of what can be achieved can be seen at the Desert Park. Mr Collins worked there for eight years and its example is what has inspired him. Mr Collins does not see eradication of buffel grass within the municipality as a possibility. The scale is too great and certainly the present resources are too small. The focus is thus on the protection of trees. Firebreak work has tended to leave buffel grass growing thickly in islands around their base so that they become even more vulnerable, the fire having nowhere else to go. The control work has to be carefully done. Open areas can be sprayed with herbicide but up close to trees the grass clumps need to be pulled back and pushed down by rakes before slashing. This prevents damage to the trees from the machinery, says Mr Collins, and is in keeping with Aboriginal Areas Protection Authority requirements. It might involve a bit of training for both volunteers and paid workers but it’s not that difficult. The issue of people camping in the river also has to be tackled, he says. Their camps are often the ignition points for fires. He can’t see a ‘zero tolerance’ approach working as it’s too resource-intensive, but attention should be paid to fire management work in the areas favoured for camping. Buffel grass is not the only target in Landcare’s sights. They have also tackled infestations of Boxing-glove Cactus in the Spencer Valley and on the Old Telegraph Station Reserve. This is labour intensive as the cactus breaks up into ping-pong ball sized pieces when it’s disturbed, and from each fragment a new plant will grow. “You have to make sure you remove every single piece so you spend a lot of time picking them up,” says Mr Collins. Cactus also does not respond to glysophate, the relatively safe herbicide that can be used on buffel grass, for example. The chemical required needs to be mixed with diesel as opposed to water, so it’s a lot more expensive and more dangerous to handle. Cactus removal is not an easy job which might explain why it hasn’t been tackled to date but it will only get worse, albeit slowly compared to the spread of buffel grass. The group has had some victories in the fight against athel pine, originally from the Middle East and useful as a fast-growing shade tree. It can survive on salty underground water but in so doing draws the salt up to the surface, making the soil incompatible with less salt-tolerant native species. It has become a major problem in the Finke River corridor where the Australian and NT Governments have spent a lot of money trying to eradicate it. The fact that the tree is on the Register of Weeds of National Significance has helped. 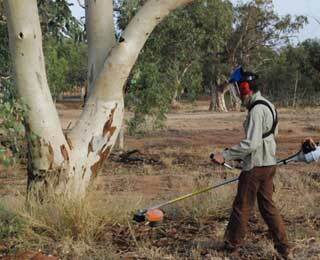 Landcare Alice Springs were able to get a grant and employ a professional in removing stands of the tree around town. Unfortunately, athel pine is not useful for timber, nor even for firewood, as it stores moisture for a long time. Some local landowners have volunteered to stockpile the felled trees on their property while they dry out and eventually they will be burnt, says Mr Collins. He says the group has made some inroads into cactus eradication on “the doorstep of the town” and certainly raised awareness of it as an issue. Batchelor Institute land management students have helped by GPS mapping of infestations and doing some chemical control, as part of the practical component of their course work. Buffel grass, while having a huge impact on the local landscape, is not in the same category because of the competing values around it – in particular the appreciation of it as a pasture grass by graziers, and its role in suppressing dust. Mr Collins says it’s a matter of striking the right balance, managing it for the different contexts. On public land in and around town, and in particular in the river corridor, it can’t be ignored. 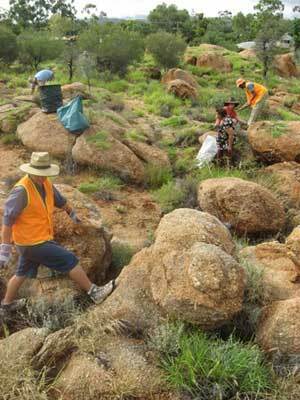 Alice Springs Landcare was boosted last year by two new groups of volunteers, one focussing on the Coolibah Swamp (remnant stands of Coolibah and Old Man Saltbush between Mueller Street and the Sadadeen connector road) and the other on public land above Kurrajong Drive. He says the more you spend time in the bush, learning about what’s there, the more attuned you become to recognising the forces that are altering it. Landcare tries to strike a blow for the wild and the beautiful – our natural heritage. Vote in the 2012 People’s Choice Award. Voting is open until 6pm (EST) on Tuesday, September 4, and the winner will be announced at the 2012 National Landcare Awards gala dinner that night. A second Central Australian finalist is the local Land for Wildlife group. Pictured, from top: Alice Springs Landcare Chair Tim Collins removing slashed Buffel Grass in the Todd River as part of the Green Corps training in 2011. Unemployed youth were trained in the use of machinery to create firebreaks, and the protection of trees from inadvertent damage. Photo by Tanya Howard. • Landcare volunteer slashing Buffel in the Todd River. The slashed grass was gathered for use as mulch on veggie gardens. Any Buffel seedlings that appear can be easily removed from a well-tended veggie patch. Photo by Tim Collins. 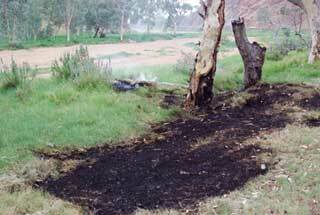 • Another small grass fire claims another River Red Gum in the Todd River. Fire fuelled by Buffel Grass is slowly killing the large trees and preventing the regeneration of seedlings. Photo by Tim Collins. • Boxing-glove Cactus in the Telegraph Station. 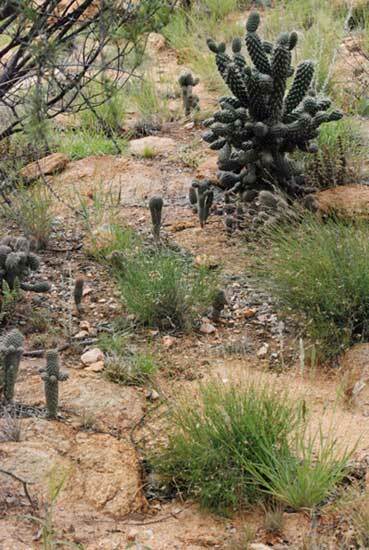 Cacti reproduce from small pieces which are shed from the larger plants. The sharp spines are a hazard to wildlife and can seriously maim when stepped on or brushed past. Photo by Tim Collins. • Buffel control day in Maynard Park, Northside, in March, 2011. Photo by Tim Collins.